He is 10 months old! So I am saving the pill pockets for an emergency. Do you want the story or not? All cage-free, hormone-free, gluten-free, blahblah organic. You add warm water and it makes a wet food. So I looked at it and thought that I could add less water and make a meatball out of it for the pills. So I took the box over to Mary, the proprietor, and asked about it. She said she hadn’t had much customer feedback yet, but thought my idea wasn’t dumb. So we gave it a try. I chose the turkey with vegetables. While Gibbs was eating his dinner, I opened the box. The herbal smell was pretty strong. It actually smelled like Thanksgiving stuffing, but with an undertone of..sour? acidic? Something I found unpleasant. I scooped out a spoonful and dumped it in a cup with a bit of hot water and stirred. It was kind of like instant oatmeal in that you have to wait a minute for it to thicken. Then I stuffed the pill inside. By that time, Gibbs had finished his dinner, so I gave it to him. He dropped it on the floor and eyed it suspiciously. Then he took a couple of licks. Then a couple of tiny, tentative, bites. He took such small bites that he bit the pill in half and I was afraid we’d have a real problem, But eventually he finished it. Day Two: same drill. It was clear that he wanted it, but he still took his time. Day Three: ate it in three bites. Day Four: he left his dinner to get his meatball. I made him go back and finish it. Then he ate his meatball in two bites. This is rather high maintenance for me to do for full meals, and I avoid wet food if I can. Also, I didn’t do any math on the cost of the daily diet, but I imagine it would be expensive. And seriously, I do not like the way it smells. But for making pill-hiding meatballs, I am calling it a success. Here is a link to the manufacturer’s website. From the reviews, it appears to be a hit with the people that want to feed their dogs a raw diet. I am not that hard-core. He brings all of his toys to my bed now. I count six in this shot. We haven’t had a lot of choking, but there have been a non-zero number of vomiting-after-meals incidents. Our solution was to give him his meals in three courses. 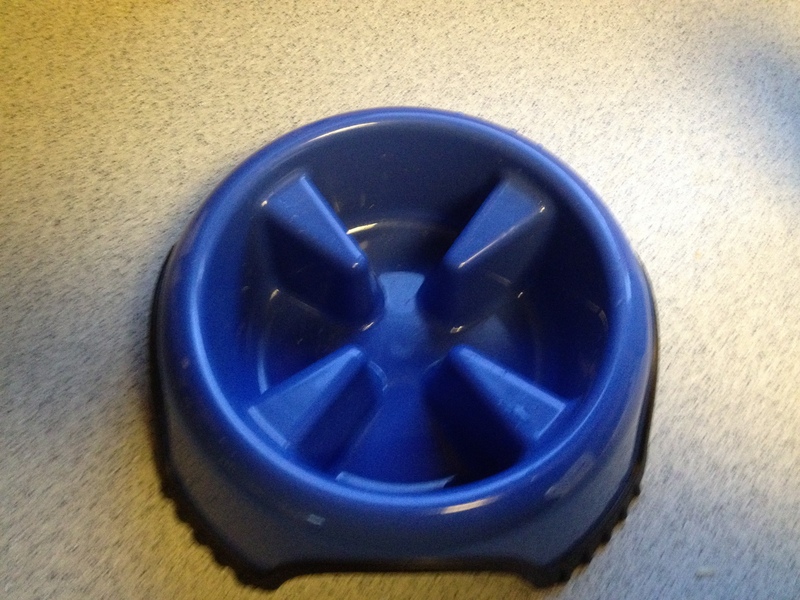 Then I started looking at “slow feeders”, bowls that require a small amount of foraging so that the dog eats more slowly. Except the store didn’t have it. I wandered around awhile and found the Omega Paw Steel Portion Pacer. 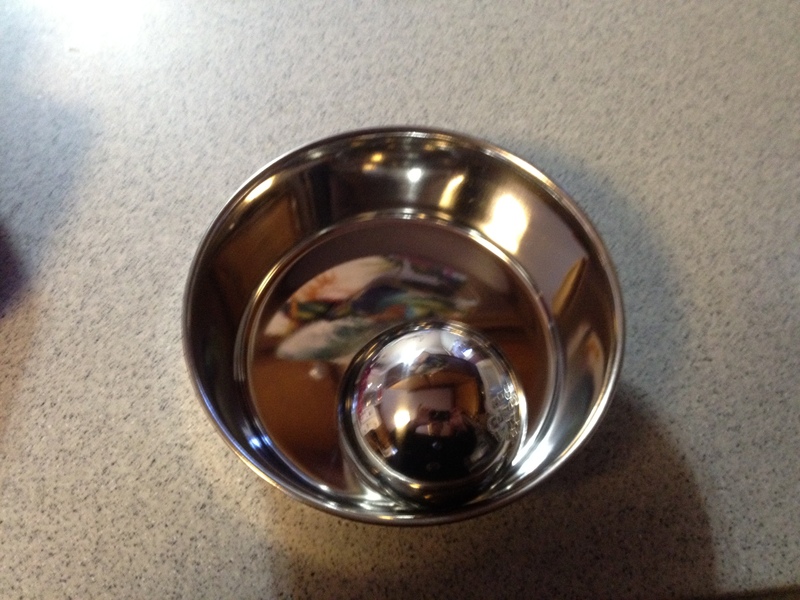 It is a small stainless steel ball that you place in the bowl. The dog has to work around the ball to eat his dinner. No way, was my thought. First of all, what is to stop my little smarty from picking it up and removing it from the bowl. And even if he doesn’t do that, what is to stop him from knocking over the bowl to spill his dinner? Actually, if he knocked his bowl over, he’d still be forced to eat more slowly. But that doesn’t sound like a better strategy than feeding a dog three courses. For ten bucks, it was worth a try. Last weekend. I put the ball into his regular stainless steel bowl and poured his dinner over it. Gibbs was agitated when I put it down. He wanted his dinner and didn’t like this. He stretched his neck out, keeping his body as far from the ball as possible. And inhaled as much food as he could get in two gulps before running away. When he came back, he barked at it. So he didn’t pick it up and didn’t knock the bowl over. But I’m sorry, if my dog is all upset while eating his dinner, we will not be helping his digestion. We will be doing the opposite of that. Back to the drawing board. Which we know as Google. Totally worked. Gibbs was not upset by it and he did take more time to eat. Gibbs is fed one cup of food at each meal, which comes very close to the top, so he can still inhale his first couple of bites. I might go back and see if there is a larger size to be had. But after two meals, I am very pleased with this purchase. Earlier this summer, my back started bothering me. Not my back actually, more like my hips. I knew it was muscular because I was walking it off almost before leaving for work each morning. This led me to believe that it was time for a new bed. I think that the average mattress is built to last for around 10 years, and I bought mine when I moved back to the house 13 years ago. I remembered that my mother had also been talking about a new bed, (in fact, she was saving her money for a really good one) and figured we should just go ahead and get them both sooner rather than later. I asked which she wanted. The Tempur-Pedic Tempur-Cloud Luxe with the Advanced Ergo Adjustable Base. Inasmuch as I was ordering two beds, I called to see if that would get me some sort of discount. No dice. But they would throw in some free pillows. I love the free take away of my old stuff. So I ordered them. With the special mattress pads at $89 apiece. That, of all things, just about killed me. But I wasn’t about to spend that much money on a bed and not protect it as prescribed. Then the guy on the phone told me they were having a BOGO on sheets. Do standard sheets not work? Yes, but because Tempur-Pedics are squared-off corners, these fit just a bit better. I don’t even want to tell you what they cost, but what the hell. And of course, delivery was scheduled for when my mother was in the hospital. I actually left the hospital just before she went in for a procedure, explaining to my grandfather that she would be much more comfortable when she gets home if her new bed was waiting for her. My mother agreed with me. The delivery team window was three hours and the delivery team arrived at the beginning of Hour 3. They were friendly and efficient and showed me how to work the remote on my mother’s hospital bed. The damn thing has a massage function. So, after four nights, I am pleased with my purchase. I half tested the jumping on the bed with a glass of red wine: it was a mug of hot chocolate with my dog climbing around. That worked. Only one set of sheets had arrived by the time the beds were delivered, so I let my mother have them and put my own sheets on the new bed. They worked fine. One warning that I saw in the reviews was that people that sleep hot might be uncomfortable because some of the mattresses – I think it depends on which model – retain heat. I do not sleep hot, which is good because I could totally feel the “retained heat” thing. And that is the scoop on Tempur-Pedic. 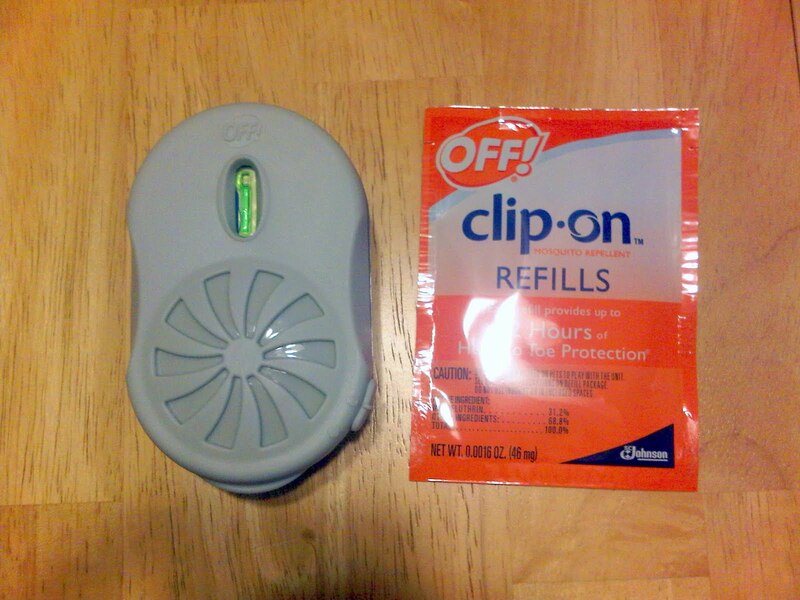 I am not up to date with my insect repellent technology. The last thing I remember is the discovery that Avon’s Skin So Soft spray worked really well. But I am housetraining a puppy and spending more time outside at odd hours than I have since the days of pretend camping at Woodhaven Lakes. Down side: Not cheap. Amazon Associates is saying 13.89 for the starter. And it requires a battery. Up side: I have not taken a single bite since that first weekend. It is quiet, and doesn’t have enough scent for me to notice it. Because I am just out with the dog, I just hold the device – I haven’t tested whether the clip thingy can hold up to a lot of physical activity. I also don’t know how long the battery will last. My friend, John Wilson, is finishing up a run in Roundhouse Productions’ MacBeth. As I type, so my blogging about it will be of no use to him. The most interesting thing about this interpretation is the use of green screen technology to add some layers. I don’t think I am a purist exactly, but I found it more of a distraction. It might be that the tech operator was a couple of beats off. But it also drew my eye away from the action, when there was action. Points for trying something new, because it was rather cool. But not necessary. Another creative bit was adding “combat witches” to the cast. They held the actual swords, creating the sound effects, while the actors mimed the action. The director talks about it here, with more symbolism than I had pegged it. But it also makes very effective use of space. In a small theater, men wielding swords in various directions can be treacherous. I appreciated that. Overall, I really enjoyed this show. I’d go back and see them again. If it isn’t Point Break. 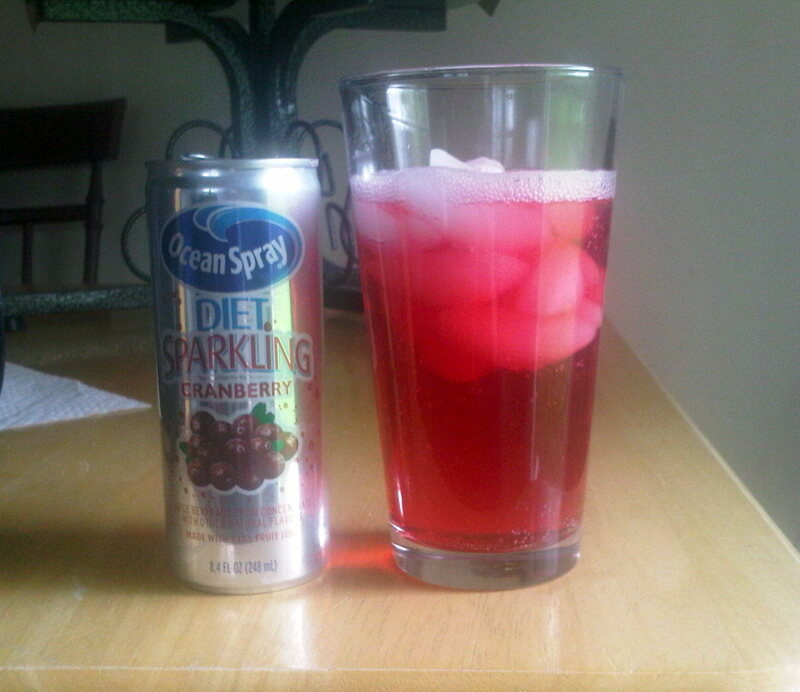 I am always jazzed around the holidays to see cranberry flavored ginger ale in the grocery store, so when I saw the commercial for Ocean Spray’s Sparkling Cranberry, I made a point to look for it. It scores major points for having a Diet variety right off the bat. I found it in the juice aisle, rather than with all of the other carbonated drinks. It came in a package of four cans. I have tossed the can now, but I believe it was 8.4 ounces, as opposed to 12 in a can of Coke. The flavor is great, and with cranberry that can be a difficult balance. However, the carbonation doesn’t hold terribly long, which might be a problem for me. I consider cranberry juice a Sipping Drink. And it is expensive. I will probably buy this as a treat when it is on sale, but it won’t be a staple in my house.